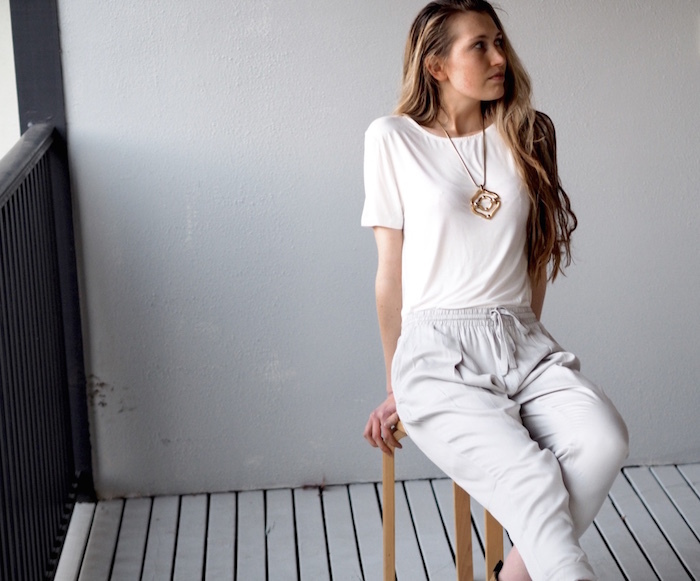 On a quest to find the perfect traveling clothes for a recent European trip, we came across The Great Beyond, who make some seriously chic organic bamboo attire. This eco-label was founded as a collaboration between Australian fashion designer Nicolas Azar, and fashion blogger Aicha Robertson (of The Fashion Heist). The pair set out to create beautiful, timeless and eco-friendly garments - to harmonise their love of fashion with their desire to promote sustainable textiles and socially responsible business practices. Nick and Aicha are also both vegan, and advocate this beautiful lifestyle through The Great Beyond's social media and blogposts. Impressed with their credentials, we purchased some of their clothes and packed them into our suitcases. The verdict: how did the clothes fare ? These garments are so comfortable that we ended up wearing them most days! Their chicly classic design and neutral colour palette (navy, grey, sand & white) allows them to be dressed up or down for different occasions, and can form the base of a quite versatile wardrobe. The bamboo material is heavenly soft, breathable and moisture absorbing. It is also thermoregulating, which means it keeps you cool in hot weather and warm in colder weather (which came in very handy for us, given the large temperature variations between chilly Scotland and hot, sunny Portugal). In terms of suitcase practicality, these garments are lightweight and roll up into nothing (which made our suitcase-laden arms very happy - especially whilst navigating escalator-less Paris metro stations, and the hilly streets of Portugal). Bamboo is a fast growing crop, which does not require intensive irrigation, nor does it rely on pesticides and fertilisers. It also self-regenerates from its own roots, so does not require replanting. In this sense, at least in its farming stage, bamboo is more environmentally gentle than widely used textiles such as non-organic cotton (which uses more pesticide per plant than almost any other crop in the world, and accounts for 18% and 25% of worldwide pesticide and insecticide use). Bamboo is also quite a durable material, meaning garments made with it can be worn and loved for longer periods of time, before being replaced. And when their time ultimately comes, they are at least fully biodegradable. However, there has been some debate over bamboo's eco-friendly credentials in recent times. The process of creating fabric from fiber can sometimes involve the intensive use of toxic chemicals, which can be very harmful to the environment. With this as a concern, The Great Beyond use a closed loop system for the production of their fabrics, which ensures the chemicals used do not harm local waterways. The clothing is also OEKO-TEX certified (indicating that it's tested for harmful substances). This is an important question, which is so often glazed over in the world of mass-produced, fast fashion. We asked The Great Beyond about their production team, which to their credit they were very open about. Their garments have in the past been made by a small team in China, who practiced safe and ethical trading, and used the closed loop system mentioned above. This company have apparently now ceased operating, due to difficult economic times in China, so TGB are introducing a new production team, who share the same values, for their next collection.